The Spearhead-class expeditionary fast transport (EPF) is a United States Navy–led shipbuilding program to provide "a platform intended to support users in the Department of the Navy and Department of the Army. The Expeditionary Fast Transport (EPF) program is a cooperative effort for a high-speed, shallow draft vessel intended for rapid intratheater transport of medium-sized cargo payloads. The EPF will reach speeds of 35–45 knots (65–83 km/h; 40–52 mph) and will allow for the rapid transit and deployment of conventional or special forces as well as equipment and supplies." The vessels are a part of Military Sealift Command's Sealift Program. The class was previously designated as "Joint High Speed Vessel (JHSV)", but was changed in September 2015. The EPF is able to transport U.S. Army and U.S. Marine Corps company-sized units with their vehicles, or reconfigurable to become a troop transport for an infantry battalion. The EPF has a flight deck for helicopters and a load ramp that will allow vehicles to quickly drive on and off the ship. The ramp is suitable for the types of austere piers and quay walls common in developing countries. EPF has a shallow draft (under 15 feet (4.6 m)). The EPF is an aluminum twin-hull catamaran shell containing four diesel engines, rudimentary control facilities for up to 40 crewmembers, and 312 airline-style passenger seats, along with an expansive flight deck on the top. The rest of the vessel is a convertible 20,000 sq ft (1,900 m2) mission bay that can be loaded to carry whatever cargo is needed. Vehicles and cargo are loaded and unloaded by a ramp that can support up to 100 tons of weight. Although designed for a military crew of 46, the ships usually have a crew of just 26 mariners. The passenger room contains reclining seats with overhead televisions and racks for weapons and equipment. Each vessel has 104 permanent berthing spaces. Without resupply, it can support 312 embarked personnel for four days, or 104 personnel for 14 days. The design is a derivative of the Hawaii Superferry, also built by Austal USA. The EPF has a greater level of comfort for the crew than larger Navy ships. The stateroom-style berthing areas for the ship's crew have private features like toilet stalls, outlets, air conditioning, and even thermostats. The same can not be said for the passengers, who may be subjected to "hot racking"-style living arrangements of available berthing bunks if necessary. There is no ship's store in the typical Navy sense of the term, but rather the ship's captain may unlock the "slop chest" and sell ship's coins and other ship-specific paraphernalia on a case-by-case basis. One disadvantage of the ship's design is instability in rough seas and at high speeds. At 10 knots in calm sea states, the hull can roll up to four degrees to each side, while conventional ships would roll very little, which would increase if the ship goes faster in rougher conditions, raising the possibility of seasickness. To achieve its top speed, the ship has to be traveling in waters not exceeding sea state 3 (waves up to 1.25 m (4.1 ft) high). At sea state 4 it can travel up to 15 knots, travel only 5 knots in sea state 5, and has to hold position in any sea state higher; while this might be seen as an operational limitation that can delay its arrival to port facilities, the ship was intended to operate closer to shore rather than in blue-water conditions. As of late 2014, an EPF costs $180 million to build and has an annual operating cost of $26 million. The Expeditionary Fast Transport USNS Choctaw County (EPF-2) awaits delivery at the Austal USA vessel completion yard. The U.S. 4th Fleet has expressed interest in using the EPF as a low-cost ship for performing drug interdiction missions around Central and South America. U.S. Southern Command is experiencing a shortage of Coast Guard cutters available to interdict drug runners due to ship age and budget cuts. In May 2013, HSV-2 Swift conducted a drug interdiction patrol, showing that an aluminum catamaran was capable of performing the role. An EPF is capable of embarking a Coast Guard Law Enforcement Detachment (LEDET). The EPF has no weapons or defensive systems to fulfill combat missions, but the Navy is looking to expand its roles to include re-supplying special operations forces and conducting humanitarian assistance missions. Chief of Naval Operations Jonathan Greenert has suggested using the ships as a cheaper way to perform counter-piracy missions to free up blue-water combatants. Offensive armament and defensive measures against pirates would be handled by a security team on board, and an EPF's speed would also be a good defense against an attack by pirates. The Navy is experimenting with using the EPF as a hospital ship by setting up an expeditionary medical unit (EMU) inside the mission bay. Although it wouldn't be able to conduct the same tasks as a full-size hospital ship, large hospital ships are slow, while the EPF can serve as a quick transit platform for rapid medical response. After various tests to explore the EPF's suitability to perform different missions, the ship was found to perform its primary role of intra-theater transport effectively, but had extreme difficulty in carrying out other suggested missions. When performing at-sea transfers of equipment with a Mobile Landing Platform (MLP), the EPF ramp used for vehicle transfers could not effectively operate with it in open ocean sea states of 2-3, and was determined to only be able to work in calm sea states found in protected harbors, an unacceptable constraint for operational deployment; the Navy has been aware of the current ramp's limitations and is developing one for use in up to sea states 3-4. When deploying a SEAL Delivery Vehicle (SDV), the EPF's stern-mounted crane could launch it in up to sea state 3 conditions, but support surface craft were needed to get divers into the underwater vehicle, which could only be launched in sea state 2. The electronic systems for this class are provided by General Dynamics Mission Systems. As the ship systems integrator, General Dynamics Mission Systems’ open architecture computing infrastructure (OPEN CI) enables the U.S. Navy to rapidly upgrade mission capability. OPEN CI connects proven, innovative hardware and software technology seamlessly and reliably. The infrastructure integrates the ship's electronic systems including; ship's computing environment, internal and external communications, electronic navigation, aviation, and armament systems, remote surveillance system, and entertainment & training system. The General Dynamics OPEN CI is also used on the Independence-class littoral combat ship (LCS), also built by Austal. The USMC is investigating changes to the EPF ramp to allow it to place Amphibious Combat Vehicles into the water near the shore. A single EPF could carry and deploy as many as 20-30 ACVs. Marine Corps General John M. Paxton, Jr. has called the EPF "a very capable ship" for certain missions, but in consideration for serving as an alternate platform for Marines to use in amphibious operations as substitutes for amphibious assault ships, he claims several deficiencies including ability to operate in difficult sea states, ability to remain survivable in contested waters, a flight deck that cannot handle the heat of an MV-22 Osprey's engines during take-off and landing, lack of a well deck to launch amphibious vehicles at sea, as well as current lack of a "splash capability" where the ramp can allow vehicles to be driven off it into the sea. The EPF has been rejected as an alternative platform to base the MV-22 off of due to weight and the heat it generates being potentially damaging to its flight deck. 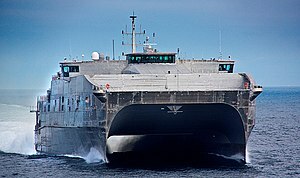 The EPF program combines the Army's Theater Support Vessel (TSV) program (dating from 2004) with the Navy and Marine Corps High Speed Connector (HSC) (requirement dating from 2004). The EPF program received Milestone A approval in May 2006. The Navy awarded Phase One preliminary design contracts in early 2008, and a detail design and construction contract in the 4th Quarter of FY08. The Navy's Program Executive Office, Ships will conduct acquisition for both the Army and Navy, but each service will fund its own ships. After delivery, each service will be responsible for manning, maintaining, and providing full lifecycle support for its vessels. USNS Spearhead, the lead ship in the class, was launched in September 2011 and delivered to the Navy in early 2012. The Navy expected to purchase 23 EPF vessels over 30 years. On 2 May 2011, all Army JHSVs were transferred to the Navy. On 30 June 2011, Austal was awarded construction contracts for EPF-6 and EPF-7. On 27 February 2012, Austal was awarded construction contracts for EPF-8 and EPF-9. On 5 December 2012, the first ship in the class, USNS Spearhead, was delivered to Military Sealift Command in Mobile, Alabama. On 10 December 2012, the Navy awarded its final option under its current contract, and ordered EPF-10. On 5 April 2013, the EPF program was added to the remit of the Littoral Combat Ship Council, so that the capabilities of both ship types could be considered together. In 2014, the USN considered outsourcing the management of the fleet, but concluded that the ships would continue to be manned by civil service mariners. In June 2011, a fifty-ton module was damaged at the Austal shipyard in Mobile during the construction of USNS Choctaw County. In 2013 a Frost & Sullivan report predicted that sales could be made to APAC countries. During operations in 2015, the first ship of the class, USNS Spearhead, experienced bow-damage from rough seas requiring more than a half-million dollars (USD) to repair. It was determined that a design change that Austral recommended to the Navy late in the design phase to save weight has resulted in a weakened bow structure. The first five ships in the class will need to have upgrades done to improve the superstructure, at a cost of $350k-$1.2M each. The remaining ships which are still various stages of construction will require upgrading following construction as well. In early 2014, Austal announced it had been awarded a $124.9 million contract for two High Speed Support Vessels (HSSV) for a foreign customer, later revealed to be the Royal Navy of Oman. The HSSV has a similar catamaran hull design as the EPF and supports naval operations including helicopter operations, rapid deployment of military personnel and cargo, and search and rescue missions. It is 72.5 m (238 ft) long and can travel at 35 knots. An HSSV has a crew of 69 personnel with 69 berths, can seat another 250, and has a cargo capacity of 320 tonnes (350 short tons). Both are to be delivered by 2016. Austal launched the first HSSV on 31 October 2015 at its Henderson, Western Australia facility. It is RNOV Al Mubshir. The first HSSV was delivered to Oman on 20 May 2016. ^ "Joint High Speed Vessel (JHSV)". Defense Acquisitions: Assessments of Selected Weapon Programs (pdf) (Report). Government Accountability Office. March 2013. pp. 83–84. GAO-13-294SP. Retrieved 26 May 2013. ^ a b c "Navy Accepts Delivery of USNS Burlington" (Press release). U.S. Navy. 15 November 2018. Retrieved 16 November 2018. ^ "Joint High Speed Vessel (JHSV)". GlobalSecurity. Retrieved 12 March 2010. ^ "Joint High Speed Vessel (JHSV)". Defense Acquisitions: Assessments of Selected Weapon Programs (pdf) (Report). Government Accountability Office. March 2010. pp. 77–78. GAO-10-388SP. ^ a b Eckstein, Megan (16 October 2015). "DOT&E: JHSV Effective At Intra-Theater Transport But Challenged In Other Missions". usni.org. USNI. Retrieved 16 October 2015. ^ Osborn, Kris (26 March 2014). "Navy Considers JHSV for Special Operations Missions". DoD Buzz. ^ Larter, David (26 July 2014). "Retiring frigates may leave some missions unfilled". Air Force Times. Gannett Government Media. Retrieved 15 August 2014. ^ "General Dynamics Advanced Information Systems to Integrate Ship Mission System for Austal Joint High Speed Vessel (JHSV)]". General Dynamics (Press release). 17 November 2008. ^ "Expeditionary Fast Transport (EPF) - General Dynamics Mission Systems". General Dynamics Mission Systems. Retrieved 9 December 2016. ^ Freedberg Jr., Sydney J. (16 April 2014). "Marines Seek New Tech To Get Ashore Vs. Missiles; Reinventing Amphib Assault". breakingdefense.com. Breaking Media, Inc. Retrieved 16 April 2014. ^ "Objective Theater Support Vessel (OTSV)". GlobalSecurity. Retrieved 12 March 2010. ^ "High Speed Connector (HSC)". GlobalSecurity. Retrieved 12 March 2010. ^ Seal, Laura M. (17 September 2011). "Navy's First Joint High-Speed Vessel Christened". Navy News Service. US Navy. NNS110917-10. Archived from the original on 23 September 2011. Retrieved 23 September 2011. ^ Brumley, Jeff (5 October 2011). "Unusual ship visits Mayport after 6-month deployment to African waters". Florida Times-Union. ^ "Army Transfers High Speed Vessels to Navy". United States Department of Defense (Press release). 5 May 2011. 384-11. ^ "Navy Awards Construction Contracts for JHSV 6, 7". Navy News Service. US Navy. 1 July 2011. NNS110701-10. Archived from the original on 28 February 2012. Retrieved 28 February 2012. ^ "Navy orders more JHSVs from Austal". United Press International. 27 February 2012. Archived from the original on 28 February 2012. Retrieved 28 February 2012. ^ "Navy Exercises Tenth JHSV Construction Option". Marine Log. 20 December 2012. Archived from the original on 16 January 2013. Retrieved 21 December 2012. ^ Cavas, Christopher P. (5 April 2013). "LCS council adds new member". Navy Times. ^ Hooper, Craig (3 June 2014). 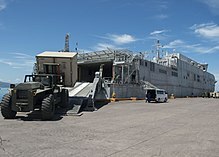 "Military Sealift Command News: CIVMARs To Operate JHSV". nextnavy.com. Craig Hooper. Retrieved 3 June 2014. ^ "Austal Awarded new A$434 Million US Navy Contract" (Press release). Austal. 16 September 2016. ^ "Secretary of the Navy Names Navy's Newest Expeditionary Fast Transport Ship". navy.mil. 13 February 2018. Retrieved 14 February 2018. ^ "Navy takes step forward on new Austal transport ship". ^ "U.S. NAVY CONTRACTS AUSTAL TO ORDER MATERIALS FOR EPF 13". Austal. 18 October 2018. Retrieved 16 November 2018. ^ "U.S. NAVY CONTRACTS AUSTAL TO ORDER MATERIALS FOR EPF 14". Austal. 3 December 2018. Retrieved 4 December 2018. ^ "AUSTAL AWARDED A$369 MILLION U.S. NAVY CONTRACT". Austal. 26 March 2019. Retrieved 28 March 2019. ^ Cavas, Christopher P. (14 June 2011). "JHSV Module Damaged at Ala. Shipyard". Defense News. ^ "Joint High-Speed Vessels May Answer the Changing Logistics Needs of Navies, Finds Frost & Sullivan" (Press release). Frost & Sullivan. PR Newswire. 20 May 2013. ^ "Spearhead". Naval Vessel Register. Retrieved 25 August 2016. ^ "Choctaw County". Naval Vessel Register. Retrieved 25 August 2016. ^ "Austal Celebrates Keel Laying for JHSV2 - the "Choctaw County"" (Press release). Austal. 8 November 2011. Archived from the original on 3 April 2012. Retrieved 11 November 2011. ^ "Millinocket". Naval Vessel Register. Retrieved 25 August 2016. ^ "Secretary of the Navy Names Joint High Speed Vessel USNS Millinocket" (Press release). United States Department of Defense. 30 May 2012. 438-12. ^ "Future USNS Millinocket (JHSV 3) completes builder's sea trials". 20 December 2013. ^ "Fall River". Naval Vessel Register. Retrieved 25 August 2016. ^ "Fourth Joint High Speed Vessel Named". United States Department of Defense. 26 March 2010. 235-10. Retrieved 26 March 2010. ^ "Trenton". Naval Vessel Register. Retrieved 25 August 2016. ^ a b c "Secretary of the Navy Names Multiple Ships" (Press release). U.S. Department of Defense. 12 April 2013. Retrieved 24 June 2015. ^ "Brunswick". Naval Vessel Register. Retrieved 25 August 2016. ^ "Carson City". Naval Vessel Register. Retrieved 25 August 2016. ^ "Yuma". Naval Vessel Register. Retrieved 2 June 2017. ^ "Navy Names Multiple Ships" (Press release). U.S. Department of Defense. 6 June 2013. Retrieved 24 June 2015. ^ "City of Bismarck". Naval Vessel Register. Retrieved 25 August 2016. ^ "Navy Accepts Delivery of USNS City of Bismarck" (Press release). U.S. Navy. 19 December 2017. NNS171219-13. Retrieved 20 December 2017. ^ "Burlington". Naval Vessel Register. Retrieved 2 March 2018. ^ "Puerto Rico". Naval Vessel Register. Retrieved 25 August 2016. ^ "Navy Marks Milestones for Two Expeditionary Fast Transports" (Press release). U.S. Navy. 19 January 2017. NNS170119-03. Retrieved 20 January 2017. ^ "Newport". Naval Vessel Register. Retrieved 2 March 2018. ^ "Keel Authenticated for Burlington" (Press release). U.S. Navy. 27 September 2017. NNS170927-07. Retrieved 5 October 2017. Wikimedia Commons has media related to Spearhead class Joint High Speed Vessel. "Joint High Speed Vessel (JHSV)". Austal. Archived from the original on 23 October 2013. Retrieved 10 August 2013.